​LUNA ROSSA are the acoustic duo of Anne-Marie Helder and Jonathan Edwards. The Award-Winning songwriting team are also famed for their work with the rock band PANIC ROOM. 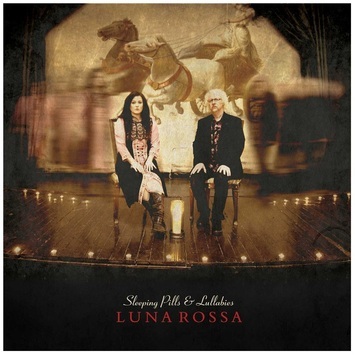 LUNA ROSSA began life as a ‘little sister’ project, where they could create the perfect outlet for any of their more acoustic, folk / rootsy material. Since their first LUNA ROSSA album was released in 2013, the project has taken on a shimmering new identity of its own, and has won critical acclaim internationally. ​on the British acoustic scene. LUNA ROSSA have just released their breathtaking 3rd album - ﻿'ATROPA'﻿ (Nov 2018) - and reviews are flooding in fast for this stunning new collection of songs! Largely based around grand piano and acoustic guitar, the stripped back arrangements allow Anne-Marie’s wonderfully rich and versatile voice to take centre stage, and weave its way through an album of stunning original music. Enhancing the instrumental palette, you will find touches of rhodes, organ, plus quirky samples and rhythm loops adding some grit to the mix . . . while the beautiful delicacy of the celtic harp, celeste, autoharp, and even some hand-played wine glasses add a shimmering ethereal quality to the soundscape. & Andy ‘Wal’ Coughlan (Cerys Matthews/Gary Numan), whose double bass playing adds a depth, brooding energy and a little 'swing' to various songs. Meanwhile, featured on cello is the wonderful Leah Evans, who breathes sultry life into the lush original string arrangements, all composed by Helder & Edwards. She contributes both as a soloist and as part of the LUNA ROSSA String Quartet with her her fellow Trinity College graduates: Artem Kotov, Rebecca Brown and Ronan Mac Manus. The debut LUNA ROSSA album shows Anne-Marie and Jon exploring the more acoustic side of their songwriting, inspired by their own unique musical paths and influences. But fans of their work in PANIC ROOM - the alt-rock 5-piece with whom they have released 5 albums so far - will also recognise their signature flashes of eclecticism, playfulness, and experimental originality. ​The haunting and soul-searching quality that also epitomises much of the Helder / Edwards writing magic is also found here, in abundance. 'bi-polar' album... of hope, and despair. and then the powerful, awakening sensuality of the album's final track - ‘Gasp’ - this is an album of many moods, colours and emotions. A very personal collection of honest and haunting songs, all of which cast a spell.